Nowlin’s solitary life gave him an abundance of time to contemplate, as this 1914 letter shows. Daniel C. Nowlin (1857-1925) was a Texas Ranger , rancher, farmer, state legislator, state game warden and superintendent of the National Elk Refuge in Jackson, Wyoming. When war broke out in Europe in 1914, Nowlin was an employee at the National Elk Refuge. In a letter he wrote to his brother, Henry, on October 25, 1914 from Jackson, Wyoming he talks about his view of the war. Very briefly, here’s my ignorant notion of the whole gigantic muddle. Morally, the guilt may be divided amongst all the great powers. All have been preparing for this struggle for many years. Germany – being the most thorough in all things – had the initial advantage and is making the most of it. Great Britain will use any nation and any means to check Germanic growth, influence and trade. Did anybody ever hear of any British qualms of conscience? Has the world forgotten the unholy war on China to protect English opium dealers? Nevertheless, our people – and all the neutral, enlightened nations, – distinctly favor the Allies – not because of prejudice against the German people but because of an instinctive preference for Anglo-Saxon civilization as exemplified by the British! The liberal world hates the autocratic “blood and iron” policy – initiated by Bismarck and accentuated by William II. Unfortunately for the German people, Germany had to impose upon Belgium (it was a military necessity if Germany was to win rapidly) and thus generated an intense prejudice – a prejudice that has been – + will be – “worked to a finish” by the British. The Germans (as we know them) are peaceable – almost timid – loyal to our flag and the leading homebuilders; and it really distresses me to hear these people (as I have lately) blatantly defending the Kaiser whom I look upon as the worst enemy of the German people! Well, it’s a bloody mess and is playing smash with us – economically, too! . . .
AS I see it, the only hope for German success – a slim, well-nigh impossible hope – is the destruction of the British Navy. The English will move heaven and earth, use every other nation (including own, if possible) and eventually hammer Germany to death – as they did Napoleon. Then English diplomacy will cheat Russia of expected spoils and destroy the friendly feeling between France and Russia – for British advantage. I hope to see Germany come out of all this (including German Austria) a democracy. England and Russia will fight some day – with Japan in alliance with Russia – but we may not live to see this. . . . In his letter, Nowlin makes some interesting observations and predictions, including that England and Russia would eventually be at war. This did not happen in a literal sense, but the two powers were opposed to each other during the Cold War and tensions continue to this day. Japan did fight England during WWII, though not allied with Russia. 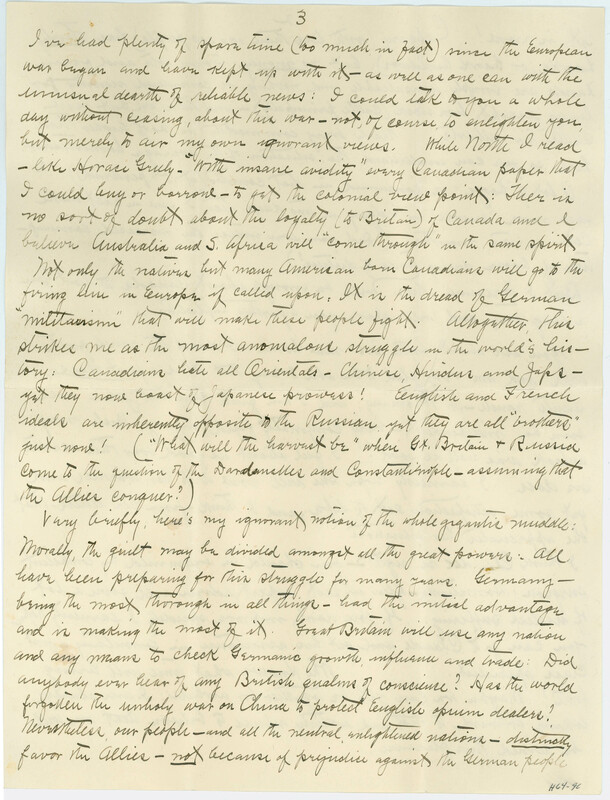 Excerpt from letter, H64-90, Percy Nowlin Collection, Wyoming State Archives. This Day in Wyoming History: Happy Birthday Gov. Houx! 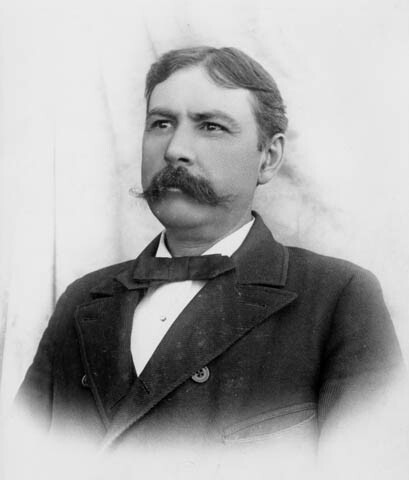 Acting Governor Frank Houx was the last Wyoming governor to regularly sport facial hair. Frank L. Houx was born on December 12, 1854 near Lexington, Missouri. He attended business college in Kansas City and was involved in various commercial activities from his mid-teens to mid-20s. Houx married Augusta Camp in 1875, a union which would produce four children; Carrie Pearl, Horace, Earl and Florence. 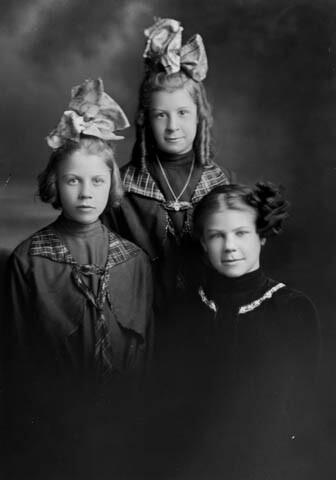 Vera, Mercedes and Thora, Houx’s daughters by his second wife Ida. During the early 20th century, it was in vogue for girls to wear larger and larger hair bows. In 1885, Houx took his family to Montana where he made a living in the cattle business for ten years. The fledgling settlement of Cody, Wyoming then beckoned and the family relocated again. Shortly thereafter Houx purchased the stage depot at nearby Corbett. Augusta died the following year and Houx returned to Cody, where he made a living in real estate and the insurance business. 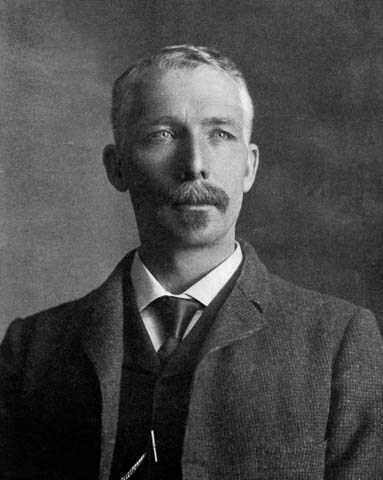 In 1898, he married widow Ida Mason Christy. Three more girls would be added to the Houx family; Vera, Mercedes and Thora. Houx was elected Cody’s first mayor after the town was incorporated in 1901. He was re-elected in 1905 and served four more years. Seeking a bigger public service role, Houx ran for the office of Wyoming’s Secretary of State in 1910, representing the Democratic Party. With recently converted Democrat Joseph M. Carey easily winning the gubernatorial race, Houx narrowly defeated incumbent Secretary William R. Schnitger. 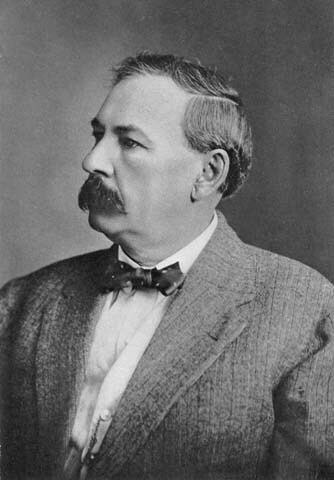 He won another close race for the same office in 1914, as Wyoming voters elected another Democratic governor, John B. Kendrick. When Kendrick was elected to the U.S. Senate two years later, Houx completed Kendrick’s term as Acting Governor. However, rather than turn the executive office immediately over to Houx, Kendrick held onto the position until the state legislative session was over. This apparent lack of trust was used against Houx in the 1918 gubernatorial election, which he lost to Robert D. Carey, Joseph’s son. 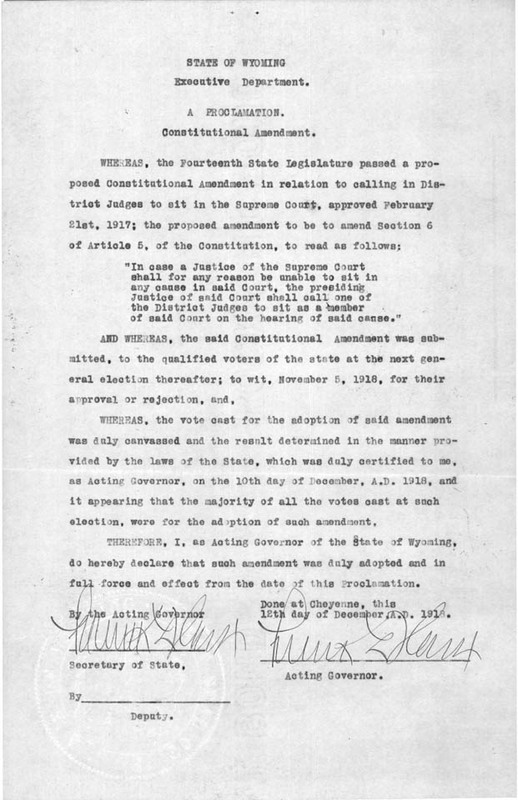 Houx signed the proclamation announcing the 1918 adoption of the constitutional amendment for prohibition in Wyoming as both Secretary of State and Acting Governor. Gov. 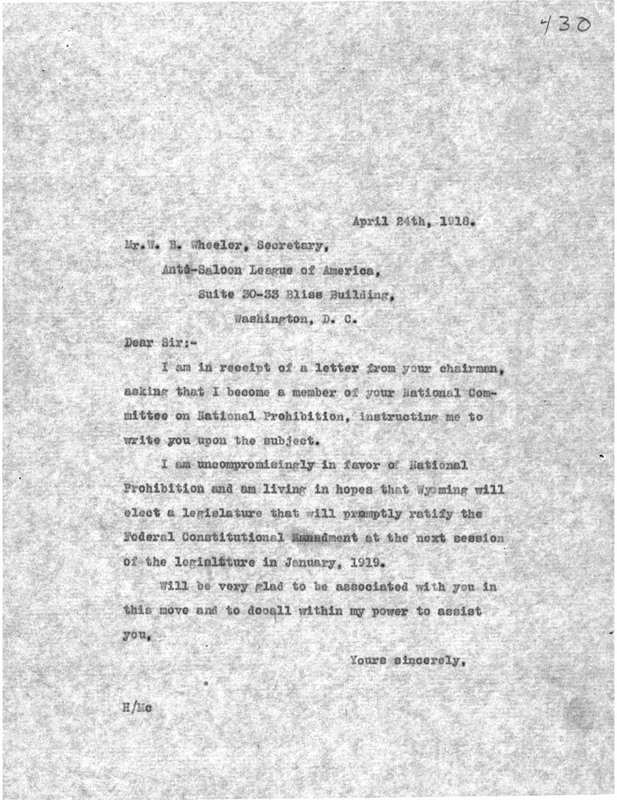 Houx himself was a vocal supporter of prohibition, as this letter shows. The United States entered World War I shortly after Houx occupied the executive office. A spirit of patriotism filled the state, resulting in about 12,000 Wyoming men joining the military. Acting Governor Houx mobilized the Wyoming National Guard, which was offered to the United States for overseas service. He also appointed the Wyoming Council for National Defense. 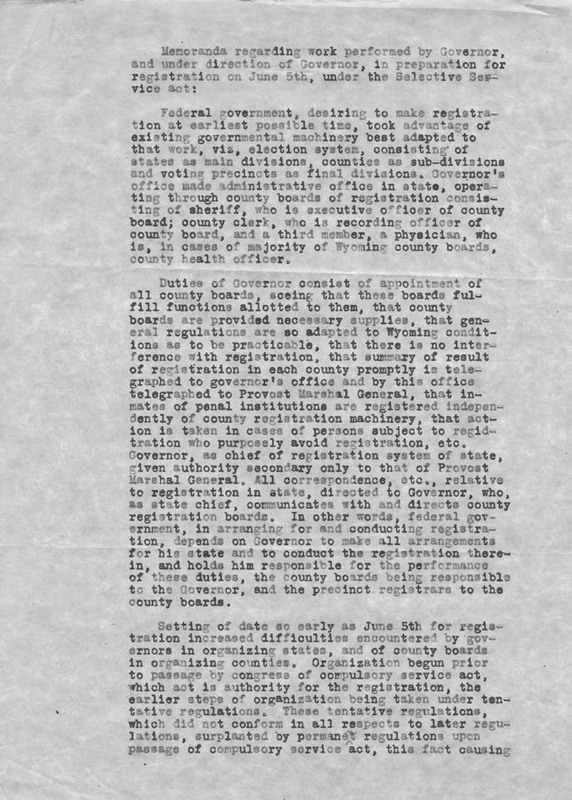 This memorandum lays out the duties of the governor in preparation for the enactment of the selective service registration starting June 5, 1917. Out of politics, Houx spent most of his later years in Texas where he engaged in the oil business. Ida Houx died in 1934 while visiting a daughter in California. Frank Houx returned to Cody the following year, residing with his daughter, Pearl Newell, until his death in 1941. He is buried in Cody. The records of Acting Governor Houx at the Wyoming State Archives are distinctive for their World War I documentation. War related series include Council for the National Defense, Women’s War Work, Army Nurse Corps, Selective Service, American Red Cross, Conscription, and Appointments and Commissions. The collection also includes the routine records associated with the duties of a governor: Proclamations, appointments, pardons, extraditions, and correspondence. In 1917, William F. “Buffalo Bill” Cody was accused of skipping out on a mortgage on a car. 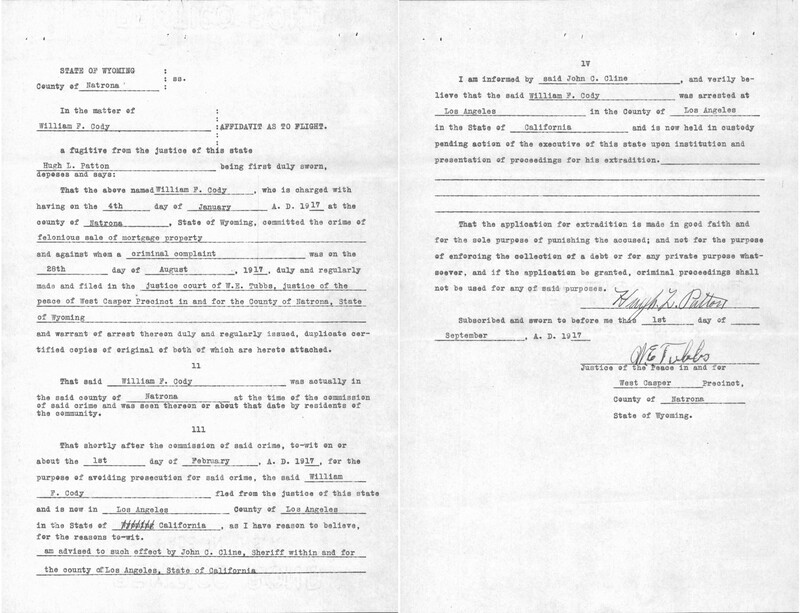 This request for extradition was filed with Gov. Houx’s administration. This must have been slightly awkward for Gov. Houx since he was a long time resident of Cody and probably knew the man. 1. UPDATE: Houx and Cody were, in fact, close friends, which would have made this extradition request very awkward indeed. According to Houx’s reminiscences published in the Cody Enterprise, he rushed to Denver upon hearing of Cody’s death in order to claim his body and transport it to Cody for burial, as per Cody’s wishes. Unfortunately, when he arrived he found that Mayor Speer of Denver had already taken charge of the body and made arrangements to bury him on Lookout Mountain.